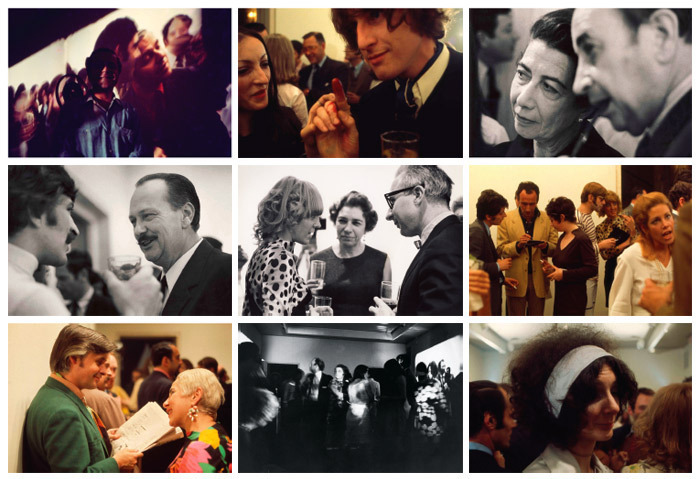 DURING HER FREQUENT TRIPS to New York in the 1960s, Argentinean artist Marta Minujín noticed that “cocktail parties were very important” to the denizens of America’s cultural and economic capital. And so, in the third week of May 1968, for her project Minucode, Minujín held four such soirees in as many days at Manhattan’s Center for Inter-American Relations (CIAR). Each party was attended by people from a different fieldpolitics, economics, fashion, and artwho were filmed, photographed, and recorded as they milled about. This documentation in turn became the raw material for an immersive film installation, which opened to the public at large at the end of the month. Until April 30, Minucode, unseen for forty-two years, is again on view at its original venue (since renamed the Americas Society), in an exhibition curated by José Luis Blondet and Gabriela Rangel. Watching the films nowfootage from each party flickering in multiple synchronized projections on the walls of a darkened gallery, as well as on visitors’ bodiesone is struck less by the period look of the guests’ clothes (and cigarettes) than by the attendees’ curiously deadpan quality. People idly chat, sip their drinks, notice the camera, glance awayand gradually it becomes apparent that these are not really cocktail parties, but representations thereof. This impression is considerably strengthened by a perusal of the archival material the curators have assembled: The attendees, it turns out, were solicited via newspaper and magazine ads and then selected by a computer, which tabulated their responses to a questionnaire in order to find the people who were most obsessive about their respective jobs. The spruced-up flirtations of the fashion and art contingents and the banal networking of the political and economic technocrats, we realize, are in truth subsumed within the same ascendant meritocracy. Minujín has long been recognized as a pioneer of the Happening, and Minucode is one of a series of projects for which the artist used different media to build intricately interlocking circuits of information, image, and experience, facilitating a highly self-critical mode of participation. Minucode, however, is the most context-specific of these works; it cannot be fully understood without a consideration of its venue. The CIAR, funded by the Rockefeller family, was one among many nongovernmental organizations that formed a phantom arm of state, practicing the soft diplomacy so essential to the prosecution of the cold war. 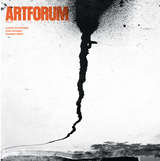 A closer look at the work suggests that it contains a subtext of institutional critique in its mimicry of the center’s ideology and outreach. At each of the cocktail parties, eight guests were sequestered in an ancillary gallery with the artist Tony Martin, of the Electric Circus discotheque (where Andy Warhol’s Exploding Plastic Inevitable had been first staged in 1966), to produce colorful slides and transparencies for light shows. These collaborative objects, now on view at the Americas Society, are striking in their resemblance to the examples of color- and light-based abstraction in Latin-American showcases of the period. The most salient example here is “Beyond Geometry: An Extension of Visual-Artistic Language in Our Time,” an exhibition curated by Jorge Romero Brest, which immediately preceded Minujín’s show at the CIAR. Mixing Op, kinetic art, and Minimalism, that exhibition posited a network connecting the CIAR to its counterpart in Buenos Aires, the Instituto Torcuato Di Tella, which was supported by the eponymous Argentinean industrialist; at the same time, the show unabashedly sought to strengthen the link between the internationalization of Latin American cultural production and the region’s “development.” A work in “Beyond Geometry” by David Lamelas made direct reference to this enterprise by arranging nine Di Tella–made televisions on a shelf along three gallery walls. Minucode, for its part, staged a farcical send-up of Pan-American optimism: Anyone, it would seem, could craft a “Latin American” work. Black-and-white and color photographs from Marta Minujín’s Minucode, 1968. IN 1968, the Center for Inter-American Relations was a very uptight place, so my idea was to use the center as a way to produce a subversive work. I’d noticed that cocktail parties were very important in New Yorka way of social climbing. I decided to have a series of these parties, inviting the people who were the most fanatic about their jobs: politicians who only talked about politics, economists who only read about economics and who decorated their offices with portraits of other economists, people from the fashion world who only thought about clothes and how to be beautiful, and artists who really lived to create art.